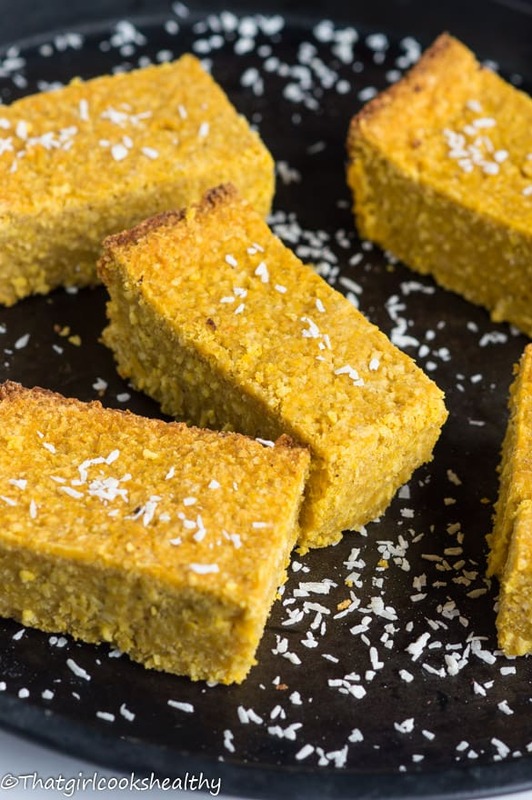 Pumpkin pone recipe – A Caribbean vegan dessert that’s a dense pudding made from grated pumpkin, coconut, cornmeal and packed with flavour from spices. I’m back with another Caribbean recipe for you all to dig into, this time I decided to head over to Guyana. Although Guyana is located in south America, it shares so my cultural similarities to its neighbouring island that it forms part of the Caribbean. If you’re from the Caribbean you’ll probably be familiar with the word ‘pone’ and would have most likely eaten it as some point in your life. My family used to make a very good pone on Sundays, we used to reserve making pone for Sundays as this was considered family time. My family would prepare copious amounts of fancy food to go with the pone – macaroni pie, brown stew chicken, potato salad, plantain etc.. it was like a feast, that’s the only way I can describe it. In case you’re wondering what exactly is pone, it’s slightly different from the stateside pone which is a bread made from maize. The definition of pone is a pudding. As with any pudding, this island style delicacy is very thick in terms of texture. The common ingredients in pone are as followed – flour, sugar, water, spices (cinnamon, allspice, nutmeg), cornmeal along with one or more root vegetable – cassava, coco (taro), pumpkin or sweet potato. It all depends on the recipe at hand or each islands method of baking pone, so there’s no right or wrong way in theory. 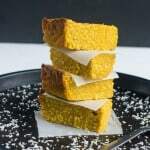 Not only is this pumpkin pone but very much a contemporary dessert with it being pumpkin season. 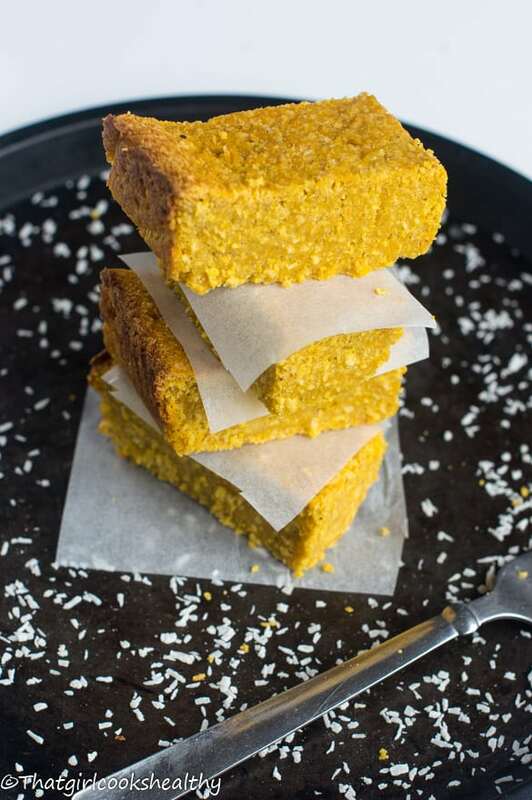 You can always embrace this wonderful treat any time of year by replacing the pumpkin with squash. – I won’t tell if you don’t! There some footnotes to go along with this recipe which I will go into detail about right now. Firstly, I suggest grinding ALL of the dry ingredients (excluding the spices) in a spice grinder/coffee mill. 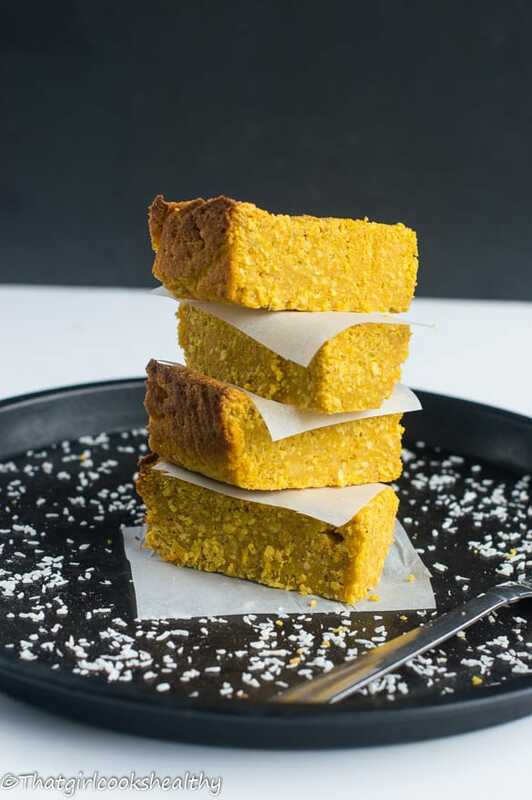 I found it tastes SO much better (no coarse,gritty texture) when the cornmeal is ultra fine along with the shredded coconut and coconut sugar. I know there’s some controversy surrounding the use of cornmeal, to be honest I seldom eat cornmeal these days because I’m consuming large amounts of protein to carbohydrates to supplement my current exercise routine. I can’t find any non GMO cornmeal in the UK so whenever I do buy cornmeal that’s not genetically modified it’s usually Bob’s Red Mill cornmeal that’s been stone milled with all the nutrients still intact. Also the pumpkin pone batter should be more on the thick side, definitely not watery at all. If the mixture is too thin, no worries simply add some more cornmeal as this will balance out the texture again. In total I used 3/4 cup of water, you really shouldn’t need more than one cup of water but this will depend on the moisture from the pumpkin. Another thing, how long the pone takes to bake will vary from 45 minutes to 1 hour, check the pone throughout baking, although I suggest increasing checks after 45 minutes if the pone is not entirely cooked. You can determine its readiness by inserting a skewer or even a knife, if it comes out clean then it’s ready. Are you ready to sample a taste of Guyana? It’s gluten free, no dairy and oh did I mention it’s vegan friendly! Line a glass square baking dish with parchment paper. Add the cornmeal and dairy free butter to a large bowl and rub into medium sized breadcrumbs . 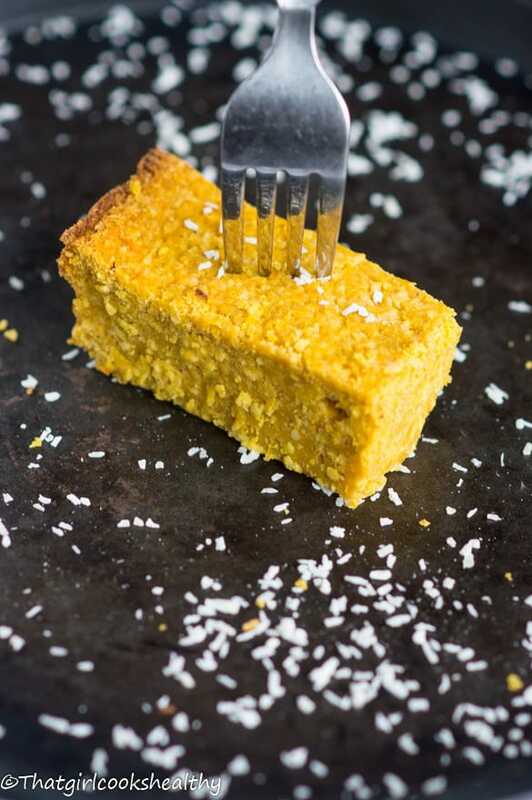 Use a wooden spoon to combine the grated pumpkin, coconut and coconut sugar into the cornmeal buttery mixture. Mix in the spices, pink salt, vanilla then gradually add the warm water. I used 3/4 cup remember the consistency should be dense not watery (the amount of water used will depend on the moisture from the pumpkin). Once the desired texture is achieved, spoon the batter evenly into the baking dish. Bake for 45 minutes – 1 hour – the top should be golden. Don’t forget to determine the readiness by inserting a skewer, if it comes out clean then the pone has cooked. Once cool store in an airtight container for 5-7 days. This looks good and I am a any pone lover,must try! Hi Rita, yes that should be fine as the texture of the grated to the canned pumpkin aren’t too different. Hi. 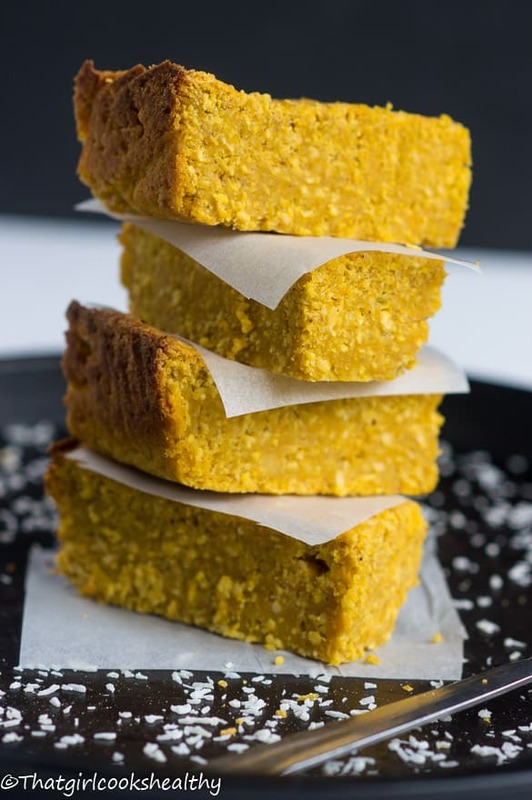 Can I use corn flour instead of cornmeal in this recipe. Hi Shirley. Yes cornflour should work just fine. I tried this recipe, 2 hours still not baked. I think it’s missing flour. Pone is a pudding which is dense and soft, Caribbean people do not add flour as it is not needed that would turn it into a cake. It may appear not baked to you but it actually is. Allow the pone to cool and it should firm up a little.